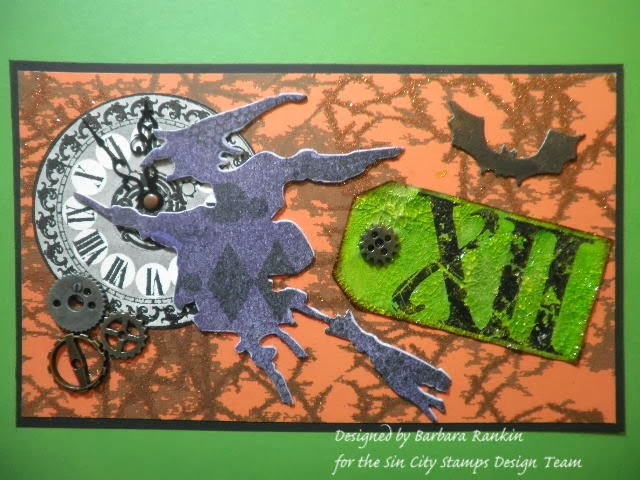 Hey there, Sin City Stamps fans, and welcome back to the continuing saga of my Halloween mini album. We are proud to have The Robin's Nest sponsor us this month. I cannot think of a better fit for two separate companies, fabulous papers and awesome stamps. 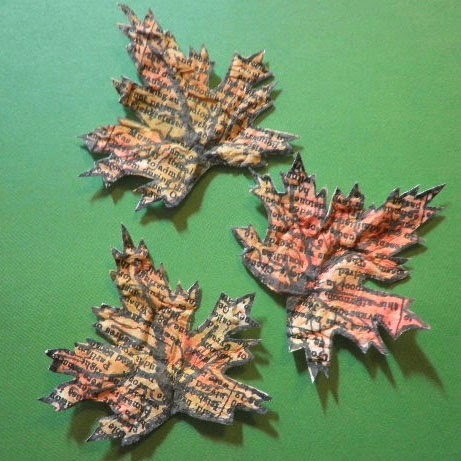 Let's start today by colorizing and stamping onto some of the beautiful Robin's Nest papers. We are showcasing their Classified Collection this month, which is a very elegant black and white line. They are all printed with a resin that acts as a resist, making them perfect for colorizing and mixing up your media. 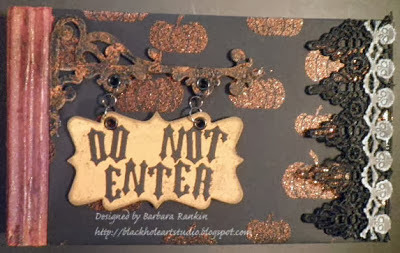 So, for my next little project, I made this Fall card using a this piece of Black and White Damask from one of my previous posts. I needed to "Fall" it up a bit, so I added more Autumn colors to it, first misting over the original colors with Auburn, then some Peach Delight, and lastly Wild Currant. I still need more orange, so I randomly spray Squeezed Orange. You see, you can continue to color this wonderful paper over and over til you get what you want. So don't be afraid that you might make a mistake... there are NO mistakes! This particular "scrap" measures 4-3/4" x 6-1/2", so I was able to tear bits off the remaining three sides to fit my card base that I made from a piece of Brown on Brown Animal Print, which I cut to 7" x 10", folded in half to make a 5" x 7" card. I then adhered this piece to my base card. Die cut two pumpkins from Orange Glitter Crackle card stock. 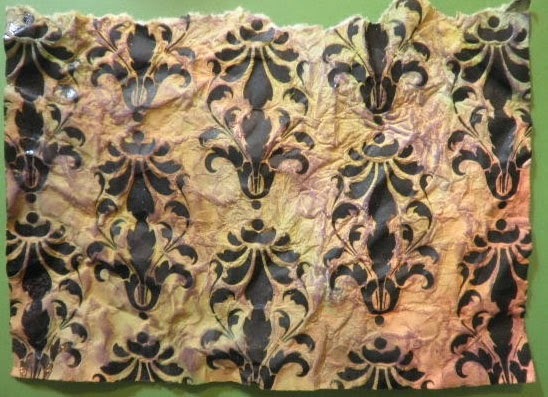 I am going to use the reverse (solid) side so they show up against my background paper. 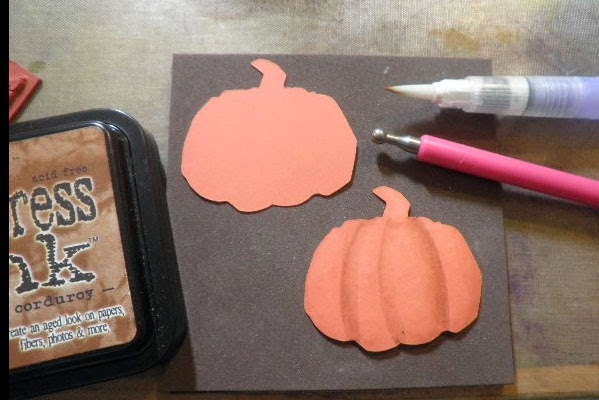 I used my trusty embossing tool and foam pad to dimensionalize my pumpkins. 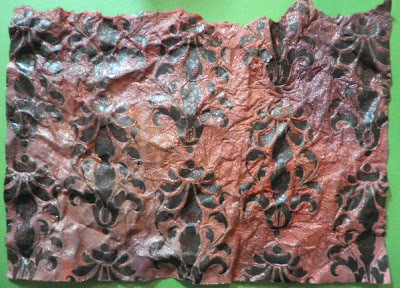 Then I used my water brush to pick up a tiny bit of Brushed Corduroy DI and run the color down in the grooves made with my embossing tool. Adhere to card front with pop dots. Stamp leaf image a couple of times onto Classified card stock with black India ink. 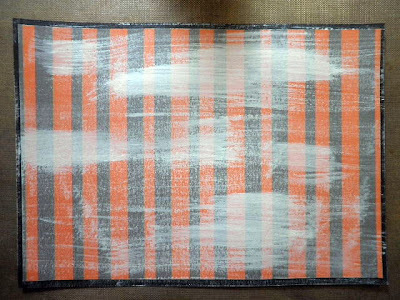 Mist paper with water, add Ripe Persimmon and Crushed Olive DP over images and spritz again. Dab up excess paint. Spritz with water again and gently wad up your paper. Carefully spread paper flat again and dry with heat tool. 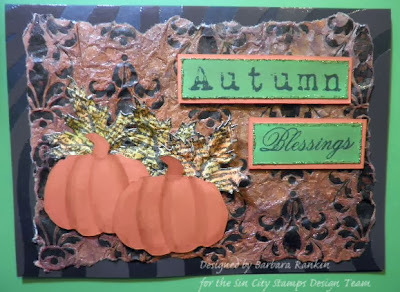 Fussy cut the leaves and adhere to pumpkins. Stamp Autumn and Blessings onto reverse (green) side of Halloween Glitter Stripe card stock. 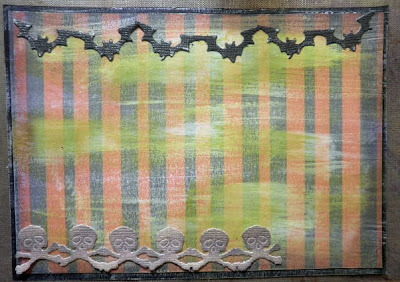 Trim close to image, edge with green glitter nail polish, and layer onto a slightly larger rectangle of Orange Glitter Crackle card stock. Adhere to card front, as shown in finished photo above. As I said in earlier posts, this Halloween mini album is a work in progress. There are so many pages, tags, pockets, nooks and crannies inside for me to embellish and decorate to my heart's content. I am having so much fun with this book, and I want to continue to share my journey in the process of making this book. I have already shown you how to assemble the book. If you missed that post, you can get those directions by clicking here. 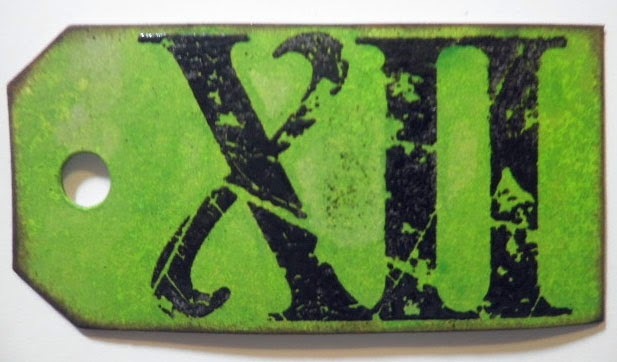 And if you want to see more stamping techniques and supply list used, you can visit my previous post by clicking here. I am going to start with decorating a couple of the pocket tags that are inserted into the various paper bags. Like I said, this little book is jam packed with places to decorate. Die cut witch and bat from chipboard, ink witch with French Lilac and mist lightly with White Linen ink spray. 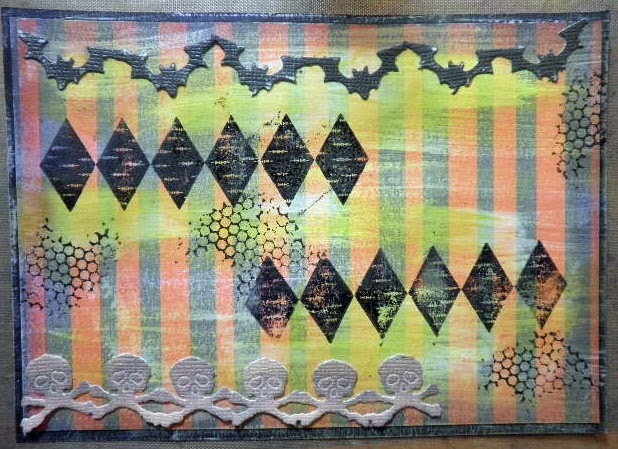 Stamp row of diamonds, honeycomb, bubble wrap, and circles in black ink from the Art Journaling with Terri Sproul set. I just love all of the elements in this set. I then used my white Pitt pen to edge the witch, using thicker lines along the edges I decided were where my light source was coming from. In this case, it is upper right. Can you see the difference? 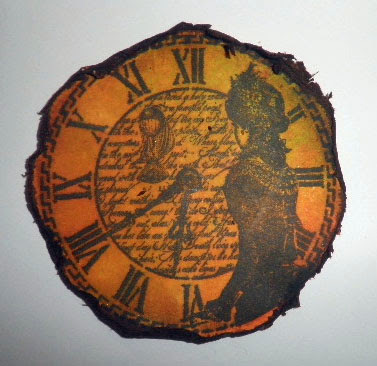 Cut out one of the clocks from Black and White Clock and adhere clock hands. 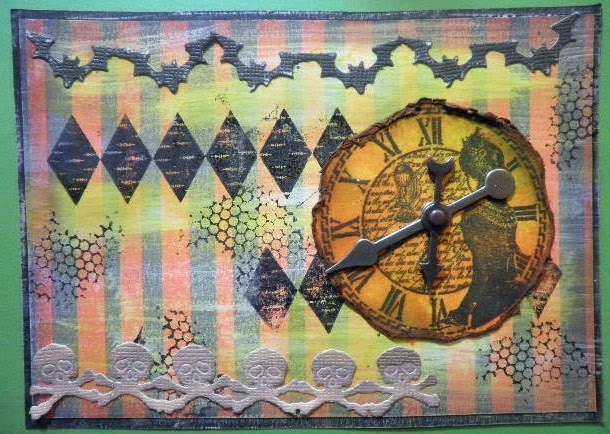 Rather than using a brad, I glued the hands down to the clock and added a tiny metal circle sticker to the center because the minute hand was a bit too long for the size of my clock, and it is going to be hidden by my witch die cut. I also do not want the hands to move for this particular tag. Stamp "XII" onto tiny tag with Versamark ink and emboss with black embossing powder. That is, after all, the bewitching hour! Mist first with Wheat Grass, then Fresh Lime. It gave this mottled look, which I really like. 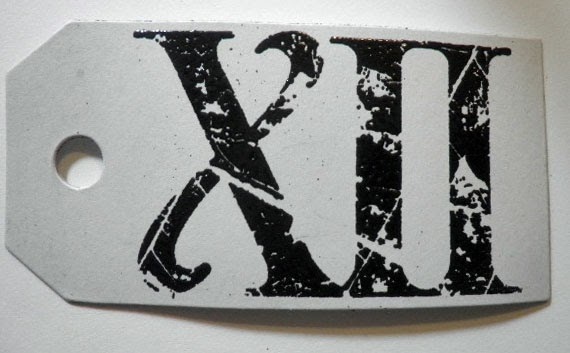 Heat set, but be careful doing this so you don't lose your embossed image. Edge tag with Gathered Twigs DS. Add clear crackle medium and let dry. Adhere to large pocket tag. 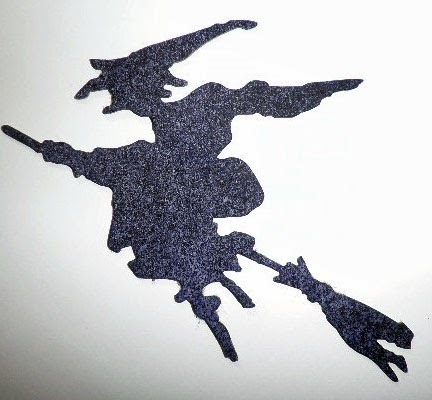 Ink die cut bat with Black ink and mist with Black Magic. 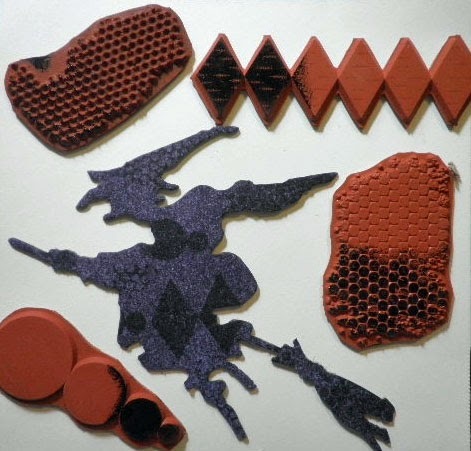 Adhere to large pocket tag, and add a few metal gears for fun. For my next pocket tag, I lightly painted white gesso on the smaller of the two paperbag pocket tags. Sponge Crushed Olive DP over entire tag, and edge distress with Dusty Concord DI. Die cut crossbones garland from cream card stock and sponge with Dusty Concord DI. 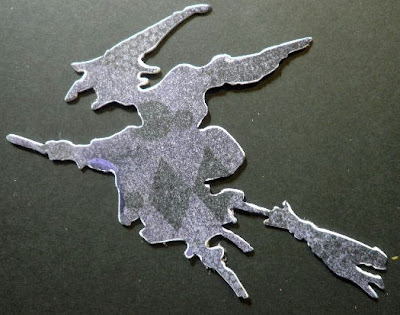 Die cut bat garland from black card stock and sand to distress. Adhere to tag, as shown. Stamp row of diamonds and honeycomb in black ink, as shown. 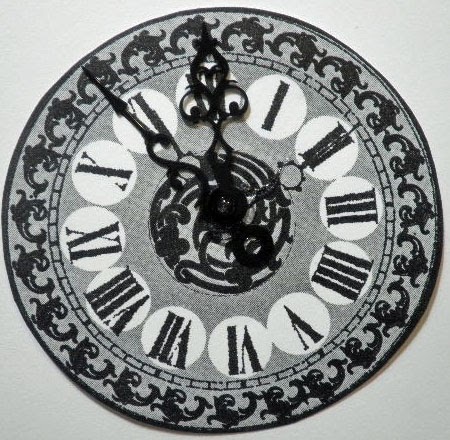 Stamp lady waiting clock face in black Memento ink onto smooth white card stock. Mist with Dylusions ink sprays (Fresh Lime, Squeezed Orange). Roughly cut out the circle and heavily distress the edges; ink with Gathered Twigs DS and sponge Frayed Burlap DI around the edge. This gives a really burnt edge effect. Add two spinners with a brad. To finish, die cut owl from chipboard and colorize with Dusty Concord DI. When dry, paint a coat of Purple Passion Glimmer Glaze. Paint eyes with green glitter nail polish. Adhere with pop dots over clock face, as shown above. Add diamond shaped dew drops over diamonds stamped image. Whew, another long post, but I just can't stop going sometimes. Don't these tags look like fun? Well, they really are, especially since they are going to decorate my mini album. But do you know what else you could use these for if you are not a book maker? These would be wonderful additions to the front of a card. And the card above would make a cool addition to one of the pockets in my book. Well, I have kept you long enough. I hope you enjoyed my projects this month and that you are inspired to make your own Halloween cards and mini album. 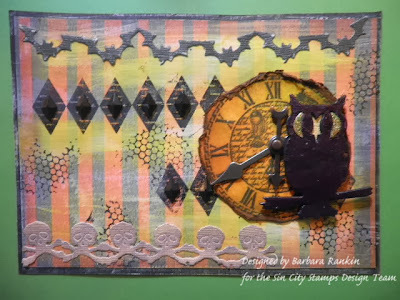 And please take a moment to visit the Sin City Stamps online store and blog for more inspiration from the design team, as well as checking out the fab papers and embellishments from our sponsor, The Robin's Nest. Thanks so much for stopping by, and have a wonderful, creative weekend! Fabulous, love all the details. Oh my heck Barbara! What wonderful work you've made!! The tutorial is wonderful!